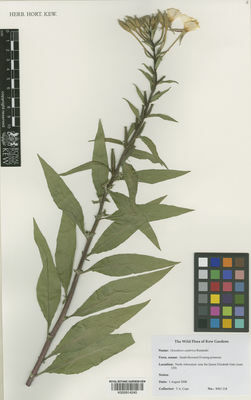 This species is accepted, and its native range is E. Canada to Central Mexico. Oenothera biennis subf. latifolia (Asch.) Thell. 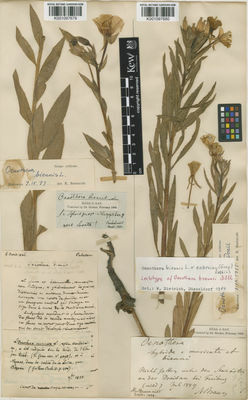 Oenothera biennis f. muricata (L.) H.Lév. ex Thell. Oenothera biennis var. rubricaulis (Farw.) Farw. Oenothera communis f. canescens H.Lév. Oenothera muricata var. rubricaulis Farw. Oenothera victorinii R.R.Gates & Catches. Vladimirov, V., Dane, F. & Kit Tan (eds.) (2015). New floristic records in the Balkans: 28 Phytologia Balcanica 21: 367-399. Ackerfield, J. (2015). Flora of Colorado: 1-181. BRIT Press.